This is my favorite wonder of the Industrial World. 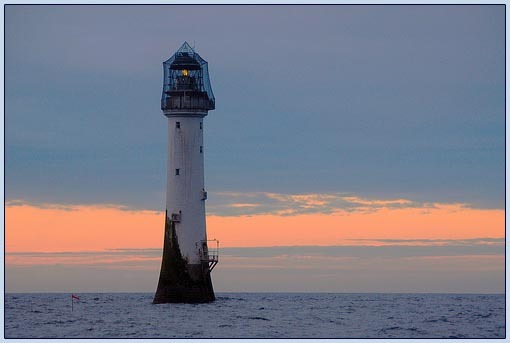 This is the world's oldest surviving sea-washed lighthouse and was built on Bell Rock in the North Sea. It stands at 35 m high, the light is visible from 35 statute miles (55 km) inland. The lighthouse was built by Stevenson between 1807 and 1810 and the lamp was first lit on 1 February 1811. The masonry work on which the light house rests was constructed to such a high standard that it has not been replaced or adapted in almost 200 years. The lamps and reflectors were replaced in 1843, with the original equipment being used in the lighthouse at Cape Bonavista, Newfoundland where they are currently on display. The working of the lighthouse has been automated since 1998. According to legend, the rock is called Bell Rock because of a 14th century attempt by the abbot from Arbroath to install a warning bell on it. The bell lasted only one year before it was removed by a Dutch pirate. This story is immortalised in The Inchcape Rock, a famous poem by 19th century poet Robert Southey. The rock was the scene of many shipwrecks as it lies just below the surface of the sea for all but a few hours at low tide. Building material - Sandstone from Mylnefield near Dundee, and Craigleith, Edinburgh Granite from Rubislaw, Aberdeen; and Cairngall, near Peterhead Courses 1-26 - granite outer casing, sandstone inner Courses 27-90 - sandstone only Mortar mix consisted of lime from Aberthaw, Wales; pozzolano or tarras (an earthy substance akin to lava) from Sicily, Italy, and Andernach, Germany, respectively; also locally obtained sand. Roman Cement was used for the outside grouting of the building.